The EVGA GeForce GTX 1080 Ti is NVIDIA's new flagship gaming GPU, based on the NVIDIA Pascal architecture. The latest addition to the ultimate gaming platform, this card is packed with extreme gaming horsepower, next-gen 11 Gbps GDDR5X memory, and a massive 11 GB frame buffer. The EVGA GeForce GTX 1080 Ti delivers truly next-generation VR performance, the lowest latency, and plug-and-play compatibility with leading headsets. It's all driven by NVIDIA VRWorks technologies and brought to life with amazing VR audio, physics, and haptics. The next generation of EVGA Precision software has arrived with EVGA Precision XOC. 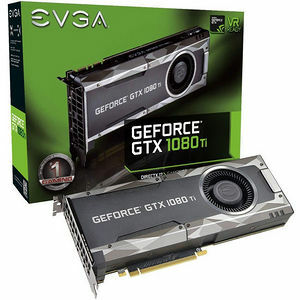 This new version of Precision is built for the NVIDIA Pascal architecture and combines the best of EVGA Precision and EVGA OC Scanner to give you never before seen overclocking features and built in automatic overclock tuning.